For when you get tired of typing out the same responses over and over again. Jar offers a handy feature called canned responses that make repetitive replies or notes less tiresome. As an admin user, you can create a canned response by going to "canned responses" under the dropdown menu in the upper right hand corner of the application. There are two parts to each canned response. The first - which category it is in and the second - what the message is. Canned response categories help you organize all your messages. For example, you may have different categories for designers and quality reviewers, or you may have different categories for teams like customer service and technical support. However you decide to organize them is up to you. To add a category, simply click on the "Add Category" button and enter in the category title you would like to use. Click "Add Category" to create the category. Once you've added your category or categories, you can now add individual messages within that category. Click into the category you would like and click on the "Add Canned Response" button. Enter in the message title (this is for internal reference only) and the message you would like to use. Click "Add Canned Response" to save that response. Using canned responses in replies and notes is easy. 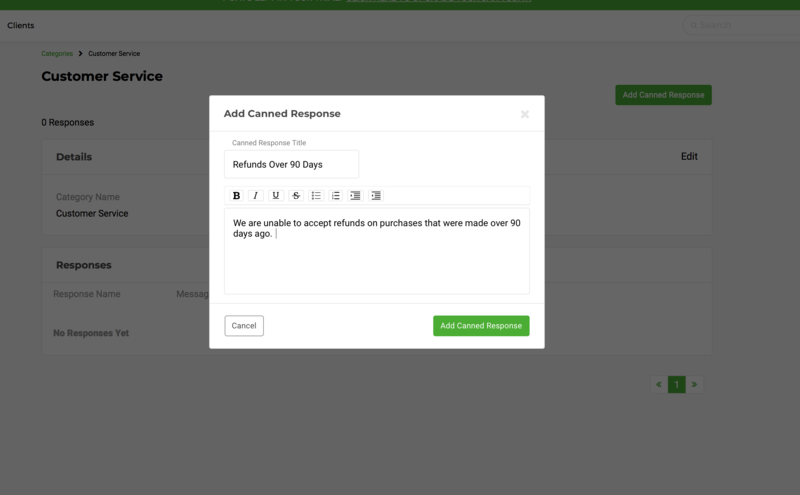 First, when your in a request, click on the envelope icon to open the canned responses modal. This will bring up a box where you can browse through your canned responses. To select which one you would like to add into the message box, click the "+" icon. You can edit the message further if you'd like, or go ahead and send right away.